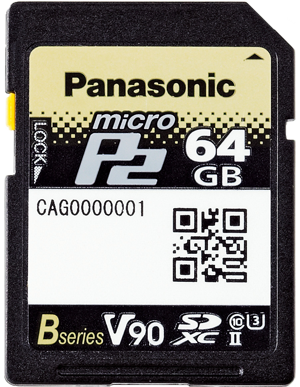 microP2 card for P2 camera recorders (P2cam), and a SDXC Memory Card for Panasonic AU-EVA1, AG-DVX200, UX Series and AVCCAM camera recorders. Fast write and read speeds compatible with SDXC V90 Memory Card support the new high-quality recording mode (4K 4:2:2 10-bit ALL-Intra 400 Mbps) of the AU-EVA1 compact cinema camera. 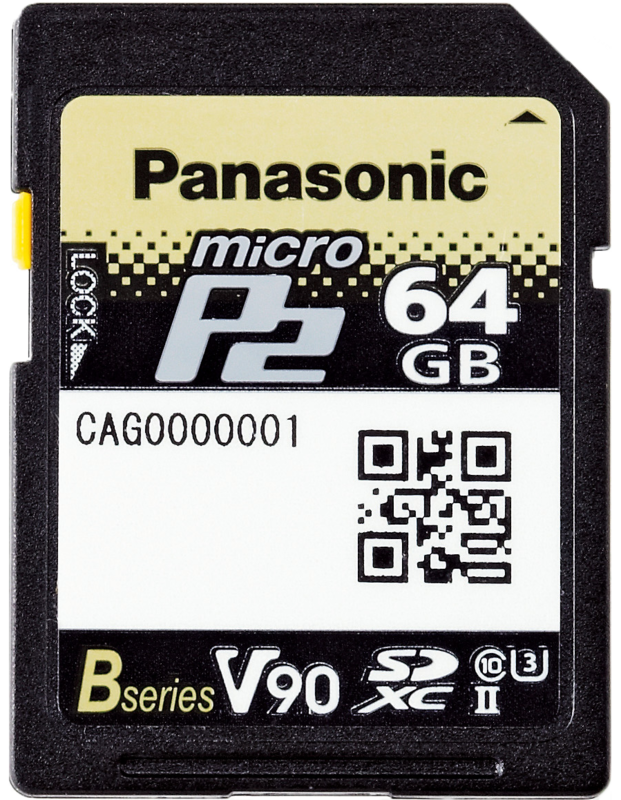 “pSLC” technology offers much higher reliability than usual SD cards. 100% screening prevents initial failure, and lifetime counter detects the card's lifetime in advance for higher professional reliability. QR code and P2CID simplify identifying and managing cards, and a large protection case enhances secure card handling. The microP2 card is static electricity proof, shockproof (over 200% stronger than SD spec), magnet proof, X-Ray proof and temperature proof (-250C to +850C). pSLC technology offers much higher reliability than usual SD cards. 100% screening prevents initial failure, and lifetime counter detects the card's lifetime in advance for higher professional reliability, alongside a QR code and P2CID are also used to identify and manage cards. In a world with an ever-growing need for speed, flexibility and in-field content management, the SD format opens up opportunities to handle content on new devices. With a 2GB transfer rate, you can download your content a lot quicker and speed up your workflow significantly. The ‘microP2 card B series’ model AJ-P2M064BG is compatible with High-Speed SDXC V90 Standards. It was designed for the new High-Quality 4K Recording Mode (4K 4:2:2 10-bit ALL-Intra 400 Mbps) for AU-EVA1. As the name suggests, we’ve miniaturized each component while maintaining all the reliability of the classic P2 card to create the microP2 in a standard SD form factor. We didn’t stop there, by using the latest SD UHS II interface technology, we’ve also drastically increased the read speed to 2GBps. It’s just as user-friendly and electronically robust as the P2 cards, but smaller, faster and more cost-efficient.